This is my friends Dog, Cleo, GSD She has some reoccuring sores on the underside of her tail. 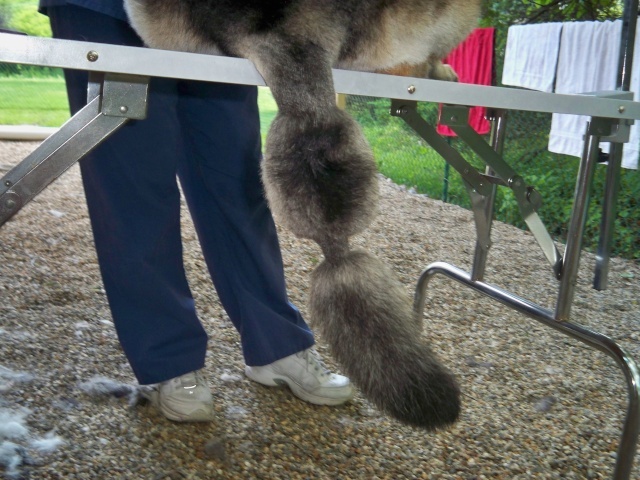 So, during grooming my friend and I thought it would be a good idea to get some air in there and ended up with a little creative grooming pom pom tail. When she got home her husband, who LOVES Natalie by the way, screamed at my friend to say CLEO IS NOT A POODLE!! I love it but I think I will pass on that with George thanks very much. Great idea to get the air to the area though. Have to agree.. oh wait. A little doggie gel could produce SPIKES!! Street Cred you make me laugh he doesn't have any before what makes you think he would have it in the future. NAWWW lorie talk about creative groom TEHE! Glad to see you back Emma... it has been way too long. I swear, Facebook has been hogging my friends, I think!!!! I only ever just pop in to see what is going on .. I spend too much time on facebook but for various reasons I love it. I'm finding my way around slowly! I am addicted to facebook HAHA! i have just had a rough time with pets and family life so had no time to catch up and chat! Hope things are getting better Emma. Lorie glad your finding your way around that is great!! I am still spending too much time on it but that is okay I do have plenty of time on my hands. Gald you are sticking around Emma! We have missed you ! Gotta get a pic of Natalie, who met a 6F blade for the first time! She's pretty even naked. Super model legs , my friend says. Good looking forward to that. HAHA Lorie i need t get pics of candace our poodle. i have clipped her into a show cut with poms and bald bottom HAHA! actually might do that this weekend! sure you all need an upodate! Candy in a continental?? Gotta see that! You betcha Emma looking forward to that and seeing the supermodels legs of Natalie.